Friday was a busy day., as is all my days lately. Scout, the granddaughter I babysit, is more and more active. She is into everything and trying to see how things work and what they do. She misses nothing that you do either. Always trying it or questioning it. Yes, this baby loves yard sales. She is a great shopper at 21 months and I love going with her. She will open the doors and drawers on furniture to make sure it works and if it does not she announces that very loudly. If they have no toys, she protests to the people running it. Friday we dropped my husband off at home and she and I went out to spend a few hours trying to keep her awake. All it took for her to go from over tired to wide awake was to tell her we were going to find some yard sales! We went to one, then another. I let her look and play even if there was nothing I was interested in. We pulled up to one and they did not have much out. I said “what do you think?” She looked at the yard and said “nother one”. I said “you do not want to go look at this one?” She said “no, nother one” . So we drove around looking for a “nother one”. Finally, I knew I had enought time to get her home and change her before her mom came. Katie got there and picked her up and then I tried to get done all I needed to get done for the day, but only had a few hours before we were to go out to dinner with some friends. My mind was scrambling and time sped by. We were meeting them at 7, it was now 6:15 and I needed to shower and dress. I put my clothes on the bed, showered, put on my face and then worked on my hair. While doing my hair I remembered the goats were still in the pen from feeding and I needed to get them out again for a bit. Throwing on my clothes I ran out, took care of them, came in and changed my shoes and hopped in the van to go. We made it just at 7. Ahhhhhhhh to sit down and relax for a bit. We talked and time flew by. Soon it was a few hours later and I had to go to the bathroom, but when I went up someone was in there so I walked back to the table. Walking back I was looked at very funny by a few men and decided I was not going to go back and try the bathroom again because they were “weird”. We went outside and stood out there talking for some time then went home. I had to put the goats up and then I was going to take care of computer work I never got to during the day. I sat at the computer and my back itched. I scratched. Something was not right. I scratched again to check. Nope, something definitely was not right. I looked down my shirt. Nope… not right at all. I forgot to put my bra on!!! Now, I am well endowed in that area. No wonder those men looked at me! And, I had to face my friends the next day when we had Angel Food Distribution! Next time I see a woman walking around like I was I will think before I criticize. I am asking you to do the same. Maybe she just was so busy she forgot. Maybe the “she” you see is me, so please let me know! As I look around the house I wonder how my husband feels when he comes home. Now, I am sure no one’s home looks like this. Mine does not either, but with a 21 month old running around making disaster I FEEL like it looks like this. I have toys around, books on the sofa and chair ( books like “Are You My Mother’ and “Simba roars”). There are stickers stuck to my husbands chair. The only reason there is not food on the floor is we have a dog that follows her around and cleans that up. Then there is my stuff. I have to sew on the dining room table. I use the top of the freezer to cut out my patterns. Right now there is a sewing machine and serger set up on the table, some stacks of fabric, a few patterns cut and waiting to sew, another on the freezer waiting to get cut out and a basket with patterns in the middle of the table. Kitchen? Dishwasher is clean but not unloaded. I wonder, how does Rick feel when he walks in and sees this after a hard day at work? Look at our side as mother’s and grammie’s who watch the grandkids all day. We are exhausted. We have played nurse, cook, housekeeper. playmate, diaper changer, poop scooper and paper towel holder (for the times the potty was not made to!). We have tried to run around like an idiot at nap time so we can accomplish something for the day. Soon we realize, usually as he is walking in the door, that it is time for hubby to come home. I wonder about marriages. Are we really giving our spouse the love and attention he needs like we do to the children? They demand it, but he needs it too. Is he getting our best? I see marriages where the husband complains about the wife and vice versa. How much could be avoided with a little planning on our part? Make coming home time a time for the kids to be excited about. Have them help make the living room nice for him to walk in to. My granddaughter is 21 months old, but I can tell her PAPA is coming soon and get her to help some. It may not be the way we would do it, but she does try and picks up things when I tell her he is coming. I make that a special thing. She looks forward to him coming. Do your hair before he comes! Still in that nightgown? Get dressed! When he comes in ask what you can get him. He may want some ice tea, coffee, whatever. Let him know he is special. If he needs time to not talk, give it to him, if not, ask how his day went. Do not start with how your day was!! Do not tell him he needs to discipline the kids. This will do two things; one, your kids will not be excited to see him and two, he will not want to come home to crabs. You are with them all day, you do the discipline when they are with you. As moms and grammies we tend to not be firm like we should, or tend to be too firm and not let them live or be kids. Both ways it makes for trouble. Where does all this get you? What about your day? When we start showing this love and consideration to our husbands they will, in turn, give it back to us. If they are unhappy and feeling neglected, they will not be able to respond to us. We are the keepers of the home, the home makers. We can also be the home breakers. Love your husband, when the kids move out of the house it will be the two of you. Do not wait till then to try to build your relationship to what it should be. I am a moose lover. People think they are ugly, I think they are beautiful. Having lived in Maine I loved to happen upon a moose, or even go in the woods looking. It is a real blessing when I see animal families interacting. I wanted to share this video of a moose mama and her babies. Enjoy. Somehow I missed last Monday with my homemaking ideas, but I think I am back on track today. How has your life been? Mine has been filled to the point my head has been spinning! 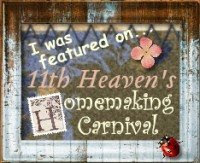 I wonder why I am even participating in a Homemaking carnival when my home gets to looking like a diseaster area. Please do not tell me I am the only one that has a home that gets messy! This weekend I found myself frustrated. Headache from something that the wind blew in, literally. Worry Concern over a new granddaughter that has jaundice, her sister who is sick and my son in law and daughter who are exhausted; sewing projects piled on the table and my sewing machine decides to act up and may need to be replaced, our work schedule, goats that keep getting tangled up because husband has not got the fence up yet, clothes dryer not able to work when the air is on as it blows the cirguit breaker at the pole (and husband has not put up clothes line yet) … the list goes on. Now, did you notice something? hint: the word “husband” mentioned? I used to be more uptight about things, but now it is hard for me to nag. I find I am more laid back and will go through the trouble of putting up with things that there is solutions for that money is not totally involved in. For instance, we have much of the wire needed for the fencing. Yes, we need some poles, but there are some to get started. It is laying on the side of the house. Something else for the goats rope to get tangled in and me have to go out and untangle. The supplies to hang the clothes line are behind my freezer in a bag. Well they were in a bag till my granddaughter played with them and broke the bag and dumped them behind the freezer. I can’t put up the line, we live in Texas and it means putting up a pole since there are no big trees. I can’t take a bath because the tub is filled with cement board and tile for a project that is started and not done. My craft/computer room is unorganized. I need to get some wood feet under one cabinet so the drawers will open and I can fix the one that broke trying to open it on the floor. A large shelf needs to be moved out too. When you live in a small place things look cluttered pretty easily. Drives me bonkers. Now, as I said, Nagging is hard for me. I think that is good in many ways. Before I nag I think. What has he been doing? How is he feeling? Is he wasting time and just not doing or is there a reason? Some projects take my time at the same time and we are not able to get it together or I need to do something just before he has to do something then we need to put it all back after he is done. This takes time together and time for each of us. Scheduling can be a problem. What I have learned after years of marriage is that we need to think before we nag and grumble. It seems so obvious, yet so hard at times. Let me explain how I learned this lesson. Before Rick, I had been married to a wonderful man. We had a good marriage. I loved him very much. However, I was much more head-strong. I would nag, sometimes with that silent nag, you know the one, get angry under your breath, grumble, have your little tantrums about things not getting done. Maybe not so others will even notice, but he knew. Arguments followed. Finally he did it, and then it may not be done right as he was now angry too. Then one day this man you love has a heart attack. Nothing that happened when you were nagging, but rather on our vacation when it was fun. He was between life and death for 3 weeks. I changed. When I knew that our life would never be the same again, it all hit me. I knew I had to do something to make life easier on him and needed to think more. Before I complained, nagged, grumbled to him I asked myself this: Is this worth him getting stressed out and having another heart attack over? If it is, grumble, if not, shut up. He lived through the attack and the following kidney failure, but we knew it was just a matter of time. I stuck with that change. I complained when he was eating something not good for him (like the bag of potato chips that were left in the house). Other times I would get after him when needed, but not like before. My husband did die and I remarried. I still think before I complain or nag. I have a wonderful husband who has a tiring life at work. I have a tiring life at home. I learned to think. Things will get done, eventually. Not on my schedule, but they will get done. I want to grumble ,sometimes, about the goat fence. The weather has been close to 100 or above out there. Would me, after working all day want to go out and work on that in this heat? Not on your life! Neither does he. Fall is coming. It will get done. Eventually. Homemaking and being a wife involve a lot. It takes sacrifice, patience and love. It is not all about us and what we need when we need it. The Bible says a nagging wife is like a drippy faucet. I have one of those too! We can’t find the part to fix it. It drips, loudly. So loud we turn off the water at the hot water heater to keep it from dripping. (It is summer and in Texas the cold water is warm enough for most things anyway!) I know I would not want to be thought of as a dripping faucet. A nag. A control freak whose husband needs to jump at my command. No way! Ladies, let’s be sure to turn off the faucet. Stop the dripping and think before we nag, grumble, complain, get on him. It is the Backwards edition of Works for Me Wednesday at Rocks in My Dryer. What this means is I get to ask you and hope that there are a lot of people out there who have “been there, done that” and know the answers! This question is for all you WAHM’s. How did you start out? I am thinking of selling online, but want to know what inventory you started with (amount) how did you decide what to sell, how did you set up your first sale? (I mean the means of putting yourself out there). I sew and have ideas but have never done anything with them. I also like other craft things as well, but thought I would start with sewing. I got a serger this week, a real blessing and cheap. (From someone who did not know how to use it, could not figure it out and sold it to get rid of it. It is basically new!) I am now trying to learn so I can make professional seams. How did you find your niche? I really would appreciate any info you can give me to help me get started. Links too! Hop on over to Rocks in my Dryer to help more people or get more answers! Oh and one last question, How do you keep your house clean, care for a toddler and work when you do not have a seperate room to do all this in?